Read the previous entries: Day 1/2, Day 3, Day 4, Day 5, Day 6, Day 7, Day 8, Day 9, Days 10/11, and Day 12. 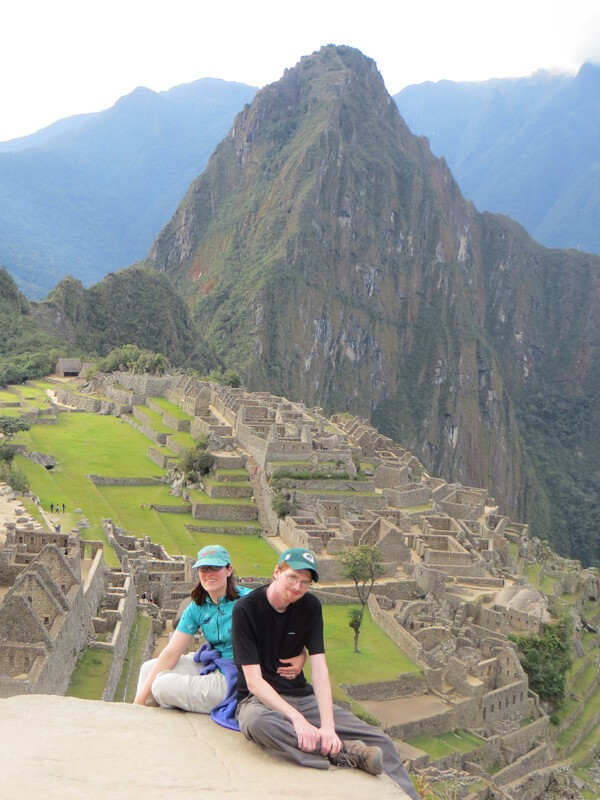 We wrapped up the trip with what’s considered one of the New Seven Wonders of the World – Machu Picchu. Unlike most people, I didn’t visit Peru specifically to see Machu Picchu, but I was very glad I did. 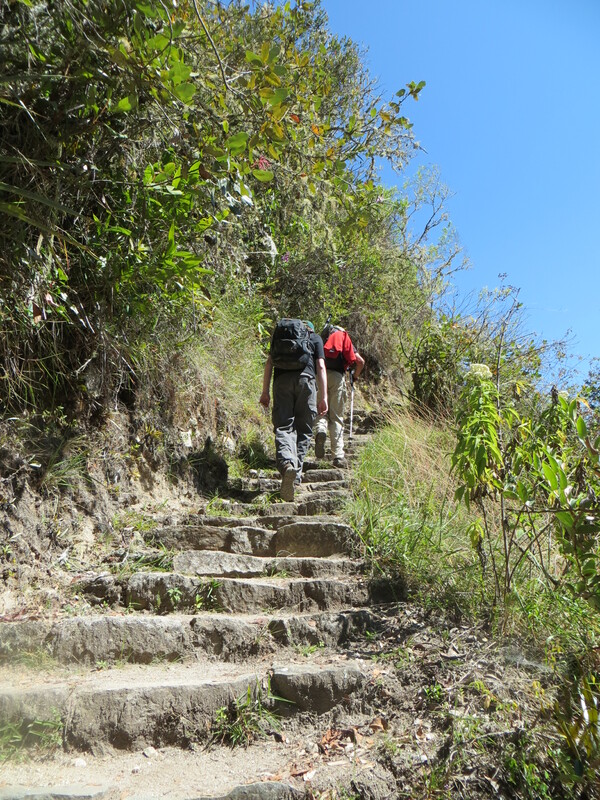 Because we chose the longest jungle trip offered, we didn’t have time to do the traditional four-day Inca Trail. Considering how badly we acclimated to the altitude, it was for the best anyway. However, I still wanted to squeeze in a little time on the trail as taking the train all of the way to Machu Picchu seemed like cheating. So we signed up for a two-day trip, where we’d hike six hours on the first day and wander around the ruins on the second. 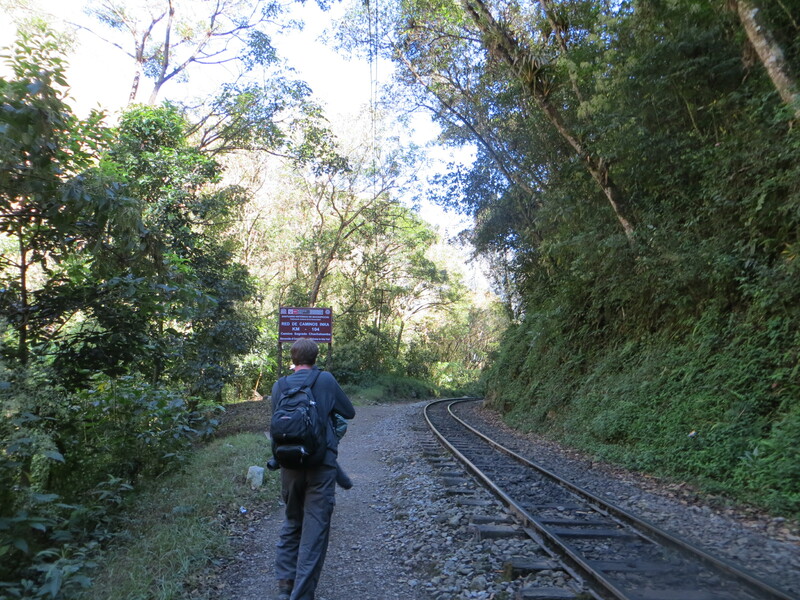 No matter where you start, Machu Picchu is far from Cusco, so we climbed on the train. In Europe, the train is mostly a form of public transportation and not exactly luxurious. In Peru, tourists aren’t allowed to take the local train and if officials find you on it, they’ll charge you an outrageous amount. Instead, you’re herded onto the tourists’-only Peru Rail trains. Trying to break Americans’ false perceptions of trains, the video playing at the Peru Rail office in downtown Cusco features a series of perky Americans testifying how “nice” this train is and so “unlike other trains.” I thought that attitude was absurd, but then, I was totally cool with taking the bus back from the Sacred Valley. With an Andean flute soundtrack and references to “exuberant” fauna on the overhead narration, the train ride served up more cheese than I had eaten all trip. After traveling for about an hour and a half, including a conversation with a cranky Baltimore native who had traveled to Antarctica, it was time for us to disembark in the middle of nowhere. Where the train dropped us off. Our first stop was at the Inca Trail ranger station. Because so many people visit, Peru has cracked down the number of trekkers who can start the trail per day. The person I made the reservations with emphasized over and over again how she needed the correct passport number for the trail permits. So when Lobo, our guide, informed me that the permit didn’t match up with my passport, I stopped breathing for a second. I then yelled, “What?! I know I gave her the right one!” (I did – she made the reservations with my old one by mistake.) When I started hyperventilating, Lobo went back to the ranger and begged for him to let us on the trail. Thankfully, the ranger conceded. I don’t know what we would have done otherwise – the train only dropped people off there and it’s the only trail to the next station. 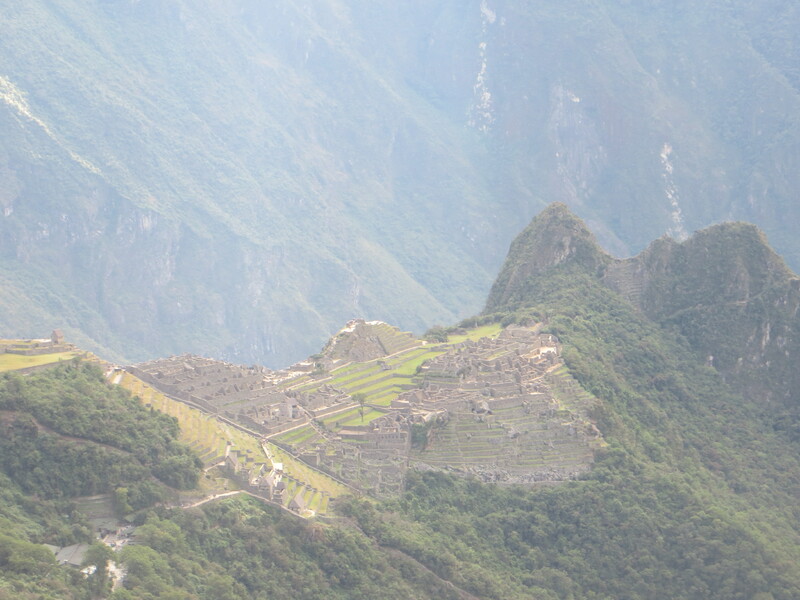 The first set of Inca ruins were only a few minutes from the gate. Appropriately, they served about the same function as the ranger station. Because the Incas had such a vast empire, they constructed a number of buildings where guards could check your credentials, messengers could trade off messages, and travelers could stock up on needed goods. Our first ruin, Chachabamba, served both this purpose and as a religious site. It had a perfectly smooth altar for animal sacrifices that looked as if the rock formed that way itself. Like Sacsayhuaman, the architecture varied depending on the importance of the section of the building. Near the altar, the rock was precisely fitted to honor the gods. In the storage areas, it was much rougher-hewn and held together with mortar, constructed with utility rather than beauty in mind. 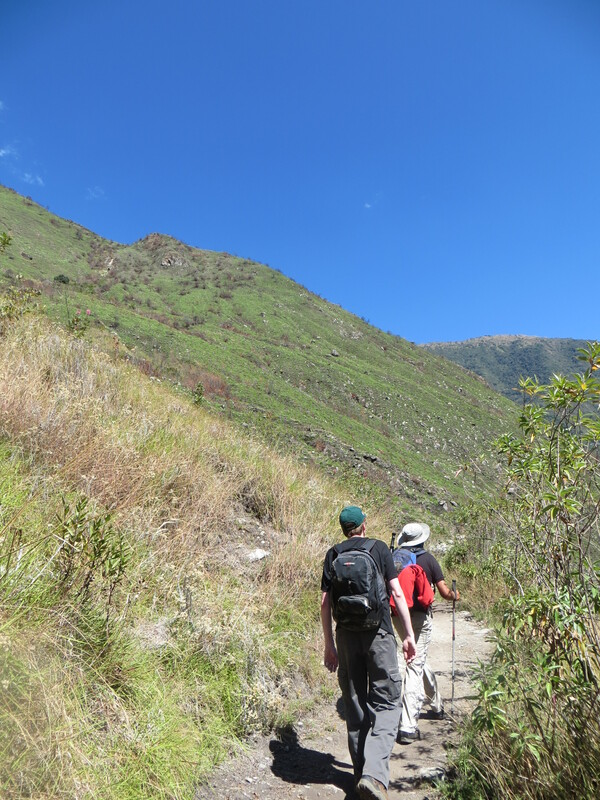 From there, we started the “Short Inca Trail” or “Sacred Inca Trail.” As the traditional Inca Trail is already high up in the mountains where we disembarked the train, we needed to climb up to meet it. Thankfully, the Incas loved building roads. Unfortunately, they never designed them for anyone but sure-footed messengers. Llamas are too weak to carry people and are more valuable for their wool production than use as pack animals. As a result, the trail was a narrow, rocky strip carved into the side of a mountain, just about one person wide. On the one side, the face of the mountain rose up before us and on the other, dropped precipitously beneath our feet. Besides its narrowness, the trail’s defining characteristic was its stairs. I joked to Chris, “The Incas must have thought, ‘Stairs! These will be the key to our empire! We must build more! '” The first three miles of our trip largely consisted of trudging upward, struggling to put one foot above the other. What made it harder was that the stone stairs weren’t very even, unlike modern stairs or even the ones in the Adirondacks built during the Great Depression. Being on the side of a cliff did have one major advantage – we never lacked for scenic viewpoints. Whenever the desire to complain started creeping up, I would look off in the distance and nearly gasp at the beauty of the snow-capped mountains rising out of the valley below. Most of the first mountain was brown or dull green, like the area we climbed up and over to get to the jungle. A number of flowers clung to the rock, with one particularly pretty orchid showing up over and over again. 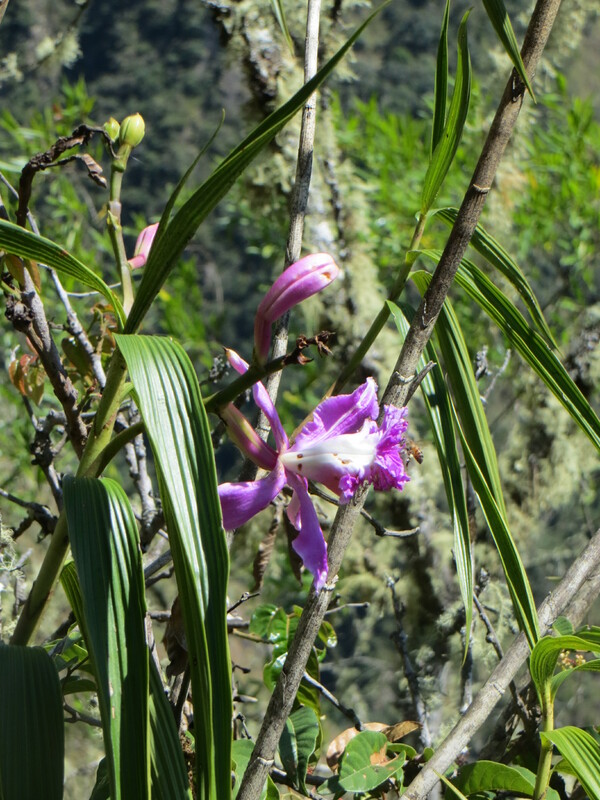 Known as the “Wiñay Wayna” or “forever young” orchid, it blooms all year round instead of just seasonally. While the flowers added bright pops of color to most of the mountain, one area didn’t need them. From the valley floor to far above us, this section was bright green, rich with new plants. A few years ago, hikers had set a fire near the river that quickly got out of control, blazing up the mountain in a few minutes. While the flames destroyed the area, they also renewed it. It’s easy to see the sharp contrast between the brown area and the green fire-burnt area. 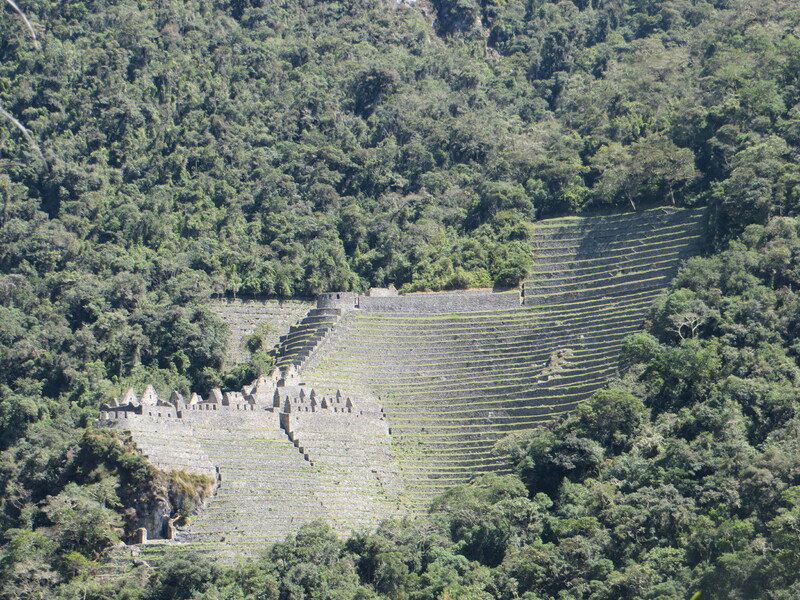 At the half-way point and after a 300 step haul, we reached my favorite archeological site so far – Wiñay Wayna. Seemingly endless agricultural terraces marched up the mountainside, with a set of perfectly formed buildings nestled within them. The stairs continued up the site, with a set of water features paralleling them. While the early archeologists called these “Inca baths,” modern historians believe that they were a fountain for water worship. Even today, rainfall still runs through some of them, creating a constant background of melodic falling water. As we caught our breath, Lobo explained how the architecture reflected the structure of Inca society. The farmers were the lowest class, and didn’t even live at Wiñay Wayna. They lived near the river and hiked up to tend their crops. And I think my 15 minute walk and 45 minute train ride is a tough commute! Some administration officials lived right on site, so that they could keep track of messengers passing by, as well as the harvest. Every religious site had a priest who lived next to the temple in a house with stonework second only to the temple itself. 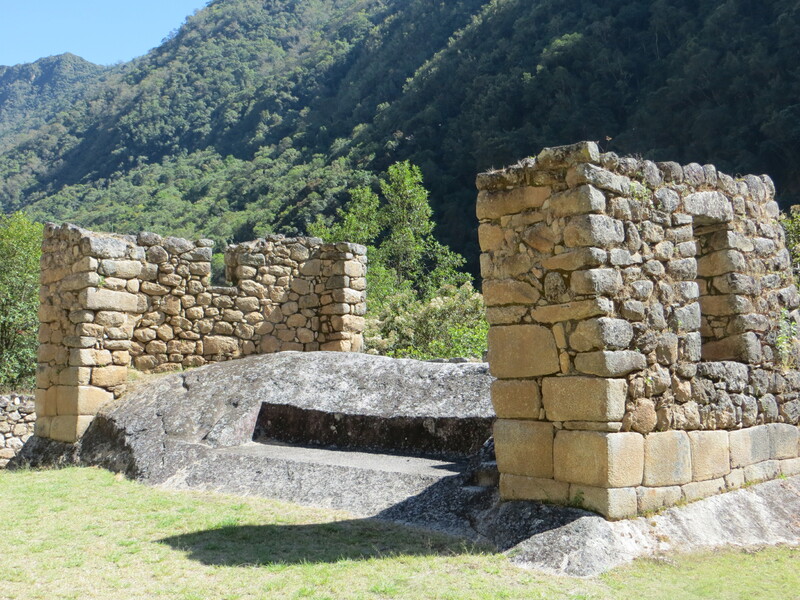 Although none of them probably lived at Wiñay Wayna, architects, high army officials, shamans, and the royal class also had the same approximate rank. Shortly after leaving the site, our trail connected with the traditional Inca Trail at the misleadingly-named Trekkers’ Hostel. While there’s a building with food and showers, there aren’t any beds and everyone camps. The toilets were squat-style and it smelled awful. It’s telling that it once had dorms, but they were so disgusting that the management tore them down rather than fixing them. Because it’s the last campsite before Machu Picchu, almost everyone on the four-day trek stays there, giving me another reason to be glad we chose the two-day instead. 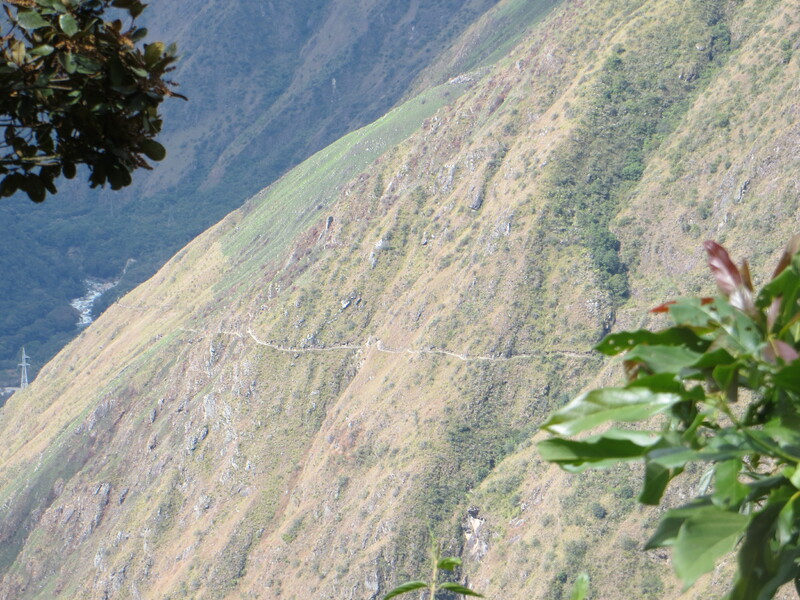 The Trekkers’ Hostel marked the transition from Wiñay Wayna Mountain to Machu Picchu Mountain. From there, we just had to work our way around to reach our destination. Just like depicted in old-time movies, Machu Picchu Mountain is far more jungle-like than the valley we had left. Greenery hung over the trail, providing some needed shade and occasionally dripping water. Considering the descriptions of bushwacking by the “scientific discoverer” of Machu Picchu, I was very glad that the trail was well-maintained these days. While mostly flat, the trail had one incredibly steep section where I had to use my hands for balance. Thankfully, that little section led us to the Sun Gate, the traditional trekking entrance. When we made our way over the little climb and saw the valley open up before us, a smile spread across my face. Below us was a city made of stone, perched between two mountains – Machu Picchu. That point completely justified the hike, because you can’t experience that introduction otherwise. Tourists who take the train the entire way first see the site in bits and pieces from below and walk up to it. As we gazed at it, the clouds opened up briefly, and a sunbeam shone down right onto the city. We made our way down a relatively wide trail and chatted with a young couple from London who were extremely glad not to be there for the Olympics. They were at the end of a nine-month global trip, where they bounced from Asia to Australia to South America. They had around-the-world plane tickets, which I didn’t even know they sold anymore. I found it interesting that for so many people, this area of the world was part of a much larger adventure. Considering how much time we spent in transit, I can see why most people don’t come there for a regular vacation like we did. After taking more photos, we took the bus down a switchback road to Agua Calientes. While Cusco is inevitably touristy, it’s still a real city with local people. In contrast, Agua Calientes is built strictly for tourists, with no shred of cultural authenticity. We stayed at the mid-priced hotel offered by our tour group, which imitated fancy American hotels, but failed at basic hospitality. For example, our bathtub was huge, but you either needed to soak the fabric curtain or flood the bathroom floor. 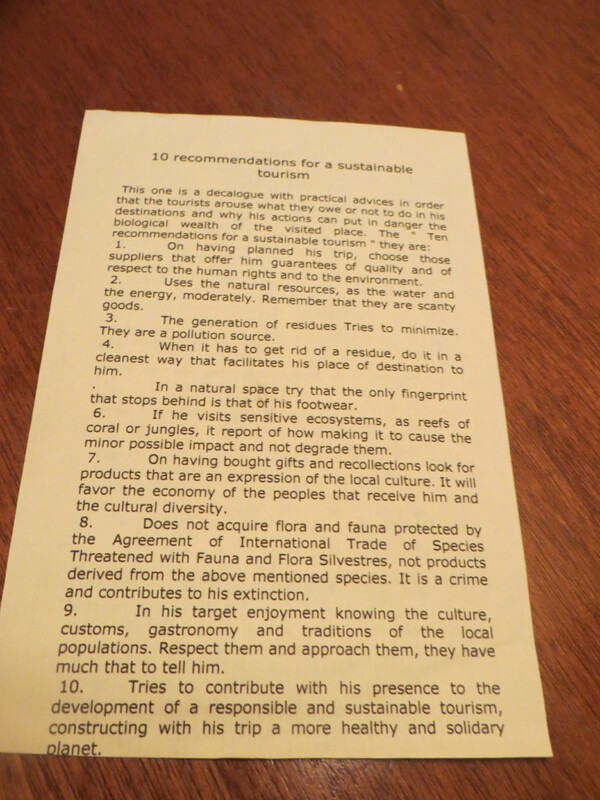 A placard in the room provided advice on being a sustainable tourist, but its translation inspired fits of laughter. Instead of “Take only pictures, leave only footprints,” it said, “In a natural place, try that the only fingerprint that stops behind is that of his footwear.” It also said, “The generation of residues tries to minimize,” which I believe is recommending people poop as little as possible. The restaurant was even worse, although you couldn’t beat the price. We would have found somewhere more our style, except that dinner came for free with the room. When I tried to order the vegetarian option, they asked if I wanted “tomato sauce or vegetables” on my pasta, to which I answered “vegetables,” confused as to why there needed to be a choice. As it turned out, they served me exactly that – vegetables served over pasta, with no sauce! I smeared the packets of butter from the bread to make up for the lack of oil or seasoning. After bringing us dessert, the server completely ignored our attempts to wave him over. Annoyed with waiting for almost a half-hour for any type of bill, but knowing we had to pay for our water and soft drinks, we put down what we guessed was the right amount and got up to leave. Only then did the waiter notice us, nastily informing us at the door that we needed to pay for the drinks. We reassured him that we had, despite never receiving a bill. Even though our B&B in Cusco lacked central heating and “fancy” trappings, the people were welcoming and the breakfasts were good. Our stay at the Agua Calientes hotel was entertaining, but I was glad it was only for one night. 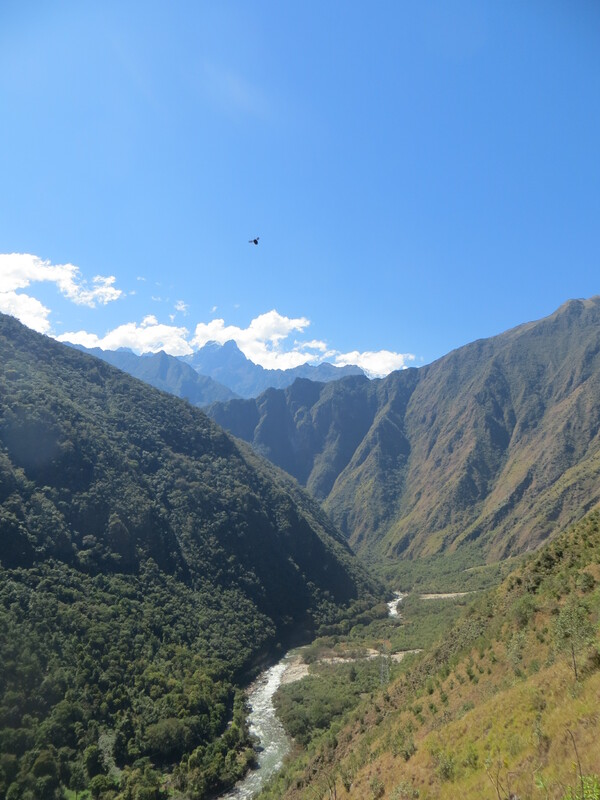 This entry was posted in family, travel and tagged hiking, Inca Trail, Machu Picchu, Peru, travel, Wiñay Wayna. Bookmark the permalink.